ESA’s European Space Operations Centre, ESOC, in Germany is ‘green’ and ready for launch following the pre-launch meeting. The operations systems, satellite and launcher are all good. 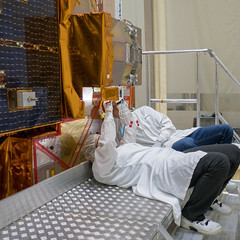 MetOp-B, Europe’s latest polar-orbiting weather satellite, is set to launch from Baikonur tomorrow at 18:28 CEST. Watch live online. From ESA’s launch campaign team, Baikonur, 14 September. The pictures say it all … MetOp safely rolled out to the launch pad and the weather looks just perfect! Yes ! We finally did it!